The Cotswolds became an important centre for the Arts and Crafts Movement in the early 20th century. Craftsmen and women followed in William Morris' footsteps, whose country home was at Kelmscott Manor, and settled in villages throughout the Cotswolds and Gloucestershire. This part of the trail takes us to Morris' home and to Cotswold villages, Rodmarton Manor and Owlpen Manor. Leading Arts and Crafts practitioners were drawn to the Cotswolds by its rich craft tradition, its accessibility to London and Oxford and by the cultivated charm of the landscape. The existing architecture served as an inspiration for the numerous large and small buildings undertaken by Arts and Crafts architects. 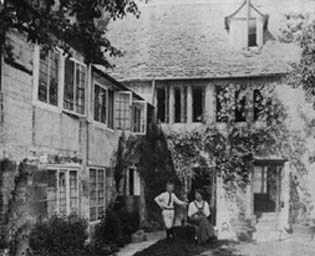 From 1871 –1896 William Morris spent his summer at Kelmscott Manor; in the 1890s three young architect designers, Ernest Gimson and the brothers Ernest and Sidney Barnsley, settled near Cirencester. 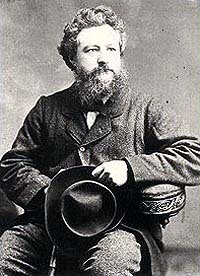 William Morris has left an indelible mark on the the world of art and design in the UK. The designs of Morris & Co. are still in production whilst the principles of the Arts and Crafts Movement continue to influence new generations of craftsmen and designers. The migration of craftsmen continued in 1902 when C.R. Ashbee and some 100 followers settled in Chipping Campden, bringing with them the ethos of the Guild of Handicraft originally set up by Ashbee at Toynbee Hall in 1888. Throughout the Cotswolds, there are many villages and churches where the work of Arts and Crafts Movement designers can be seen, although many houses are still in private ownership and not open to the public. Of course, the exteriors are still free to view! This tour starts in the north Cotswolds, at Chipping Campden with its rich legacy of work by the Arts and Crafts architect CR Ashbee and the members of the Guild of Handicraft. From here the Guild of Handicraft came to have a worldwide influence as profound as that of the Morris company, providing a model of communal living, profit sharing and joyous labour. Among the many surviving buildings is Elm Tree House which Ashbee converted into Campden School of Arts and Crafts in 1904 .The Ashbees lived in Woolstapler’s Hall from 1902-11 which has Arts and Crafts interior features. In nearby Broadway another craftsman, Gordon Russell, established a workshop and showrooms. 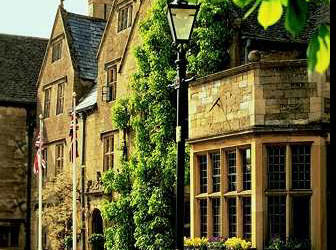 The Lygon Arms is the former manor house dating back to 1620. It was taken over by Gordon’s father, SB Russell, in 1904. The architect CE Bateman added the Great Hall as a new dining room with plasterwork by the Birmingham Guild. South of Cheltenham is Painswick with a number of Arts and Crafts buildings: the Congregational Church in Gloucester St has a window by Morris & Co; the Gyde Almshouses in Gloucester Road were designed by Sidney Barnsley in 1913, as were the public baths in St Mary’s Street. The Gloucestershire Guild of Craftsmen has its own exhibition every August and shows the variety and excellence of their workmanship. Other places of interest outside Painswick are Holcombe House, Olivers, Paradise, and Painswick Lodge, the latter altered and restored by Sidney Barnsley in 1925/6. At Sapperton are several buildings designed by Arts and Crafts architects for themselves. Norman Jewson made interior alterations at Batchelor’s Court, an 18th century Farmhouse. Beechanger was built by Sidney Barnsley for himself and The Leasowes was designed and built by Ernest Gimson for himself. Upper Dorvel House was built by Ernest Barnsley, for his own use, and he also built the village hall in 1913 with assistance from Norman Jewson. Near Cirencester, Gloucestershire, is Rodmarton Manor, one of the last country houses built and furnished using local stone and timber, by Ernest Barnsley and the Cotswold Group of craftsmen. The house, built for Claud and Margaret Biddulph, took 20 years to complete (it was finished in 1929). There is furniture and pottery by Alfred and Louise Powell, wall hangings by Helda Benjamin, lead and brass designed by Norman Jewson and iron work by Fred and Frank Baldwin and Alfred Bucknell. The garden was designed by Barnsley. 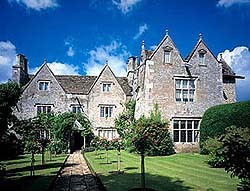 To the west of Stroud is Owlpen Manor, dating from the 15th century with a magnificent Tudor Great Hall, Jacobean wing and Georgian parlour. The manor house was repaired by the outstanding Cotswold Arts and Crafts architect Norman Jewson in 1926, after it had become something of a sleeping beauty, dwarfed behind enormous yews and uninhabited for over 100 years. On view is a collection of Cotswold Arts and Crafts furniture and associated items by Sidney Barnsley, Norman Jewson and Ernest Gimson, among others. See Owlpen Manor for more information. A tour of the Cotswolds would not be complete without a visit to Kelmscott Manor at the eastern end of the Cotswolds on the way to Oxford. William Morris chose it as his summer home, signing a joint lease with the pre-Raphaelite painter Dante Gabriel Rossetti in the summer of 1871. Morris loved the house as a work of true craftsmanship, totally unspoilt and unaltered and in harmony with the village and the surrounding countryside. He considered it so natural in its setting as to be almost organic, it looked to him as if it had "grown up out of the soil"; and with "quaint garrets amongst great timbers of the roof where of old times the tillers and herdsmen slept". 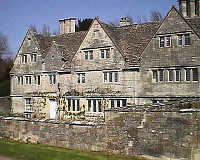 Kelmscott Manor is owned and managed by the Society of Antiquaries of London.